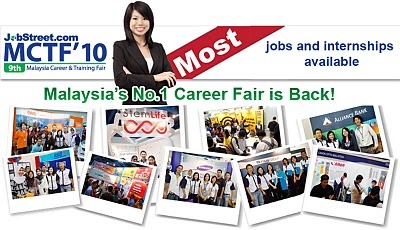 The MCTF’11 (Malaysia Career & Training Fair 2011) is back in April featuring 100 over companies from various industries – companies looking for talented, enthusiastic, and bright people like you. Meet them face-to-face at the fair, speak to them, and impress them. Don’t miss this chance to showcase your resume and attract both local and international top companies from this career fair. 116.Worldtech Solutions Sdn Bhd 79.AND MANY MORE ESTABLISH COMPANIES!!!! !